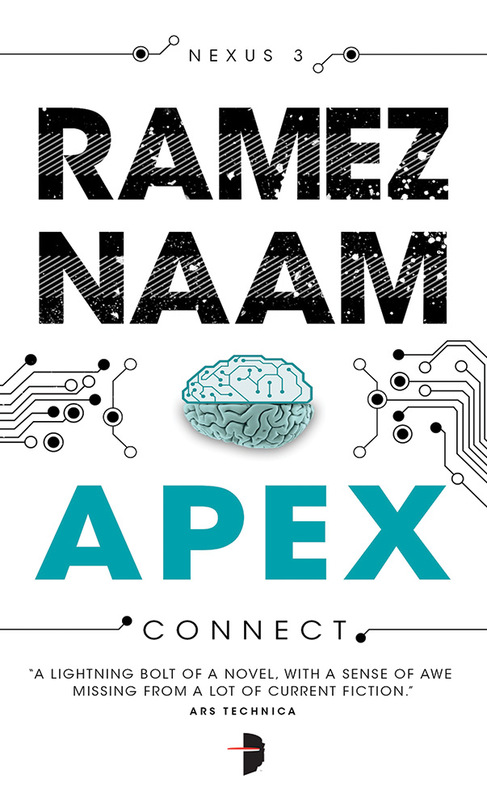 If you follow me on Twitter, you may be over hearing me crow about Ramez Naam’s fabulous, award-winning sf thrillers NEXUS, CRUX and, now, APEX. But if you’ve read the books…ah, that’s a different story! You’ve probably already begun proselytizing yourself! APEX, the epic conclusion to the series is out today in digital and one week from today in print. You can read an exclusive of the first chapter of APEX up at i09, see the Geek Library review here or find out what the big idea is over on John Scalzi’s blog. You can take B&N’s word for it as a Best Pick for May. Or, you can head over to Ramez’s website or your bookseller of choice to check the series out for yourself! The cover copy for APEX and some reviews for the series are below. Global unrest spreads through the US, China, and beyond. Secrets and lies set off shockwaves of anger, rippling from mind to mind. Riot police battle neurally-linked protesters. Armies are mobilized. Political orders fall. Nexus-driven revolution is here. Against this backdrop, a new breed of post-human children are growing into their powers. And a once-dead scientist, driven mad by her torture, is closing in on her plans to seize planet’s electronic systems, and re-forge everything in her image. A new Apex species is here. The world will never be the same.